Barcelona have won the race to sign highly-rated Ajax midfielder Frenkie de Jong, the Spanish club announced on Wednesday. The 21-year-old will join Barca on July 1 for 75 million euros ($85 million), with a further 11 million euros due to Ajax in additional payments. 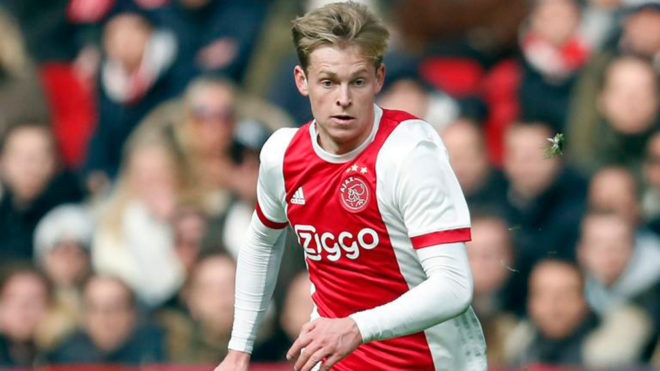 De Jong, who is considered one of the most exciting young players in Europe, will begin a five-year contract with his new club. “Barcelona and Ajax have reached an agreement for the transfer of midfielder Frenkie de Jong, who will be joining the Catalan club from July 1, 2019,” a Barcelona statement read. De Jong had attracted interest from a host of European clubs, with Paris Saint-Germain and Manchester City reportedly among those keen. After coming through the ranks at Willem II in the Netherlands, De Jong signed for Ajax in 2015. He has been a first-team regular for the past two seasons. “He’s a great player, who certainly has a great future,” Barcelona coach Ernesto Valverde said on Saturday. De Jong will also follow a prestigious line of Dutch players to represent Barcelona, which includes Johan Cruyff, Ronald Koeman, Patrick Kluivert and Frank de Boer. He will be given an early taste of Spanish football when Ajax face Real Madrid next month in the last 16 of the Champions League.